Recently a friend asked if she could borrow my vintage hats for a Young Womens activity. I'm the kind of person that has a collection of vintage hats. At least I was. Last year, in a misguided attempt to clear away the clutter, I gave my collection away. I felt bad about not being able to provide a bonnet, boater, or bandeau. Well, actually, I did have one...in October I purchased a black pill box hat and attached a stuffed raven and black roses, but it hardly seemed appropriate in January. To the Sandy Antique Mall! 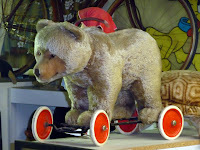 The place with the polar bear outside, and the REAL grizzly inside. I found a couple of reasonbly priced hats, some porcelain ornaments that would be perfect for my mother's Christmas tree, and set of circa 1940 bathroom accessories--little china jars marked "cotton" and "creme"--that will be perfect on a mirrored boudoir tray. I also found some wonderful old children's books, cloth-covered with their titles etched in gold. I didn't make all of my purchases right then. Some I bookmarked in my mind and crossed my fingers that they wouldn't be gone by the time my next paycheck came in. I've already divulged my weakness for vintage items, mellowed with age and the patina of romance I tend to give them. But have you noticed that the craftsmanship is often so much better? My mom's washing machine is from the 1970's, but it's still cycling, and why should she replace it with one made in 2011 and made to break down in 2015? 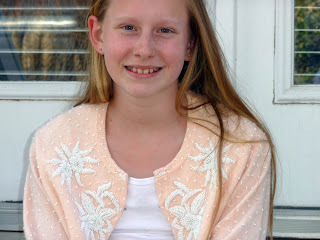 At a small consignment shop in Leavenworth, KS, I bought a vintage soft peach cashmere sweater, satin-lined, covered in seed pearls. It didn't fit. It never will. But it is a work of art. It's craftsmanship is worth preserving. Even if it remains on hangar, hung on my wall, it reminds me of all things lovely, delicate, and enduring. It looks great on my friend's 11 year-old daughter. Maybe someday it will go with her prom dress. The Sandy Antique Mall was also the source of a unique birthday present I received from some unique friends (my favorite kind). They bought me 500 of 1000 shares of the West Indies Sugar Corporation. The certificate is stamped Feb. 28, 1958. Although the stock expired in 1960, it's a wonderful old document that deserves a frame. 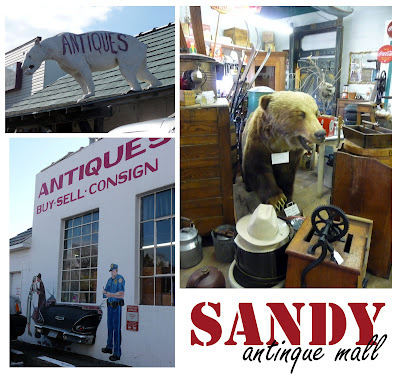 The Sandy Antique Mall also has architectural salvage, furniture, vintage jewelry, ancient typewriters, brownie cameras, antique dolls, and the afore-mentioned bear. And that's just the tip of the iceberg. By looking up at my clock (modern--bought at Shopko), I can see it's town for Downton Abbey. And so, I bring this missive to a close. Jealous I'm way over here! How on earth could you give your hats away! I am such a big vintage hat fan. Qwendy, my OCD (which takes the form of tidiness rather than hoarding) is in constant conflict with my love to collect. Giving the hats away was a touch of insanity. My new mission is to replace them. I love to collect old books. In fact, my collection includes some books dated in the 1920's. I rarely find old children's books in the vintage stores I have visited. I think I'd drop by the Sandy Antique Mall one of these days to check out what they have. Danny, we have something in common. I too collect old books. Mine are not terribly valuable, but I still love the hunt. I recently found an Uncle Wiggley.